This entry was posted on August 20, 2013 by Jessica Anderson. With summer winding down, fall is in the air. What are the new trends for this fall? Just like with fashion, Trophies and Awards have fresh styles for the season change. Our awards experts have rounded up the top must-have award trends for Fall 2013. This new gray plaque is right on trend! In fashion this fall, it's all about gray as the new neutral. Lucky for us, awards look great in gray too! One new gray product I love is our new Acrylathin plaque. What is awesome about this plaque is that the logo or other graphic can be cut through the material, so the silver background shows through. Looks hot! 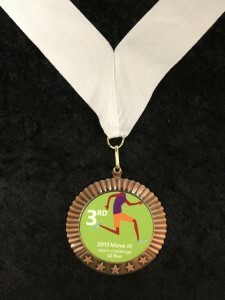 Two trends in one - bronze 'rose colored gold' medal with a custom insert! One of the hottest color trends for fall is rose. No longer just for spring, rose is showing up in surprising places, including jewelry. We are following this trend with new bronze awards, including metals, trophies and other 'rose colored gold' items. A huge trend in awards right now is creating your own design, unique to your organization. Custom awards are big, and we love making them! We have a process called Logocut, where we create full-color acrylic awards out of any logo. We also create one-of-a-kind inserts for metals. 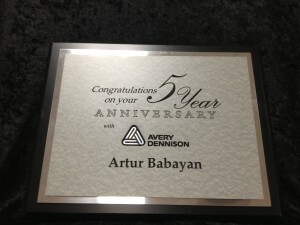 These allow our customers to create unique awards tailored specifically to their event. So cool! Just like in fashion, we offer premium designer awards on our website and in our showroom. CIP, Nik Meller, Chien Wang of Toujours are 3 of the designer crystal award lines we carry. These superior crafted awards feature unique and stunning designs that are pieces of art, worthy of display. Mix things up with your awards this fall by picking a trendy piece! Just like with your wardrobe, adding just one new item can really jazz up your awards program!